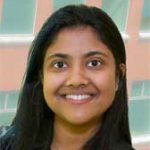 Aindrila Mukhopadhyay leads a multidisciplinary team to study stress response in bacteria using microbiological, biochemical and systems biology tools. As part of JBEI’s Fuels Synthesis Division, Dr. Mukhopadhyay is the Director of Host Engineering. Her projects include the study of two component signal transduction systems in the anaerobic sulfate reducing bacterium Desulfovibrio vulgaris Hildenborough and the study of a desert soil crust bacterium, Microleus vaginatus. In the study of metabolically engineered microbes, Dr Mukhopadhyay focuses on the role of efflux pumps as a mechanism to relieve toxicity from metabolite accumulation and increasing titer of metabolite production.